UN Women’s Office based in New Delhi covers four countries: India, Bhutan, Maldives and Sri Lanka. In these countries, we strengthen women’s rights by working with women, men, feminists, women’s networks, governments, local authorities and civil society. With all of them, UN Women helps to create national strategies to advance gender equality in line with national and international priorities. Ending violence against women: Violence against women and girls is a grave violation of human rights. Its impact ranges from immediate to long-term multiple physical, sexual and mental consequences for women and girls, including death. UN Women responds to violence against women and girls in all its forms – from domestic violence, trafficking to violence in public places. Promoting Leadership and Participation: Women are underrepresented as voters, as well as in leading positions, whether in elected offices, civil services, the private sector or academia. This occurs despite their proven abilities as leaders and agents of change, and their right to participate equally in democratic governance. UN Women advocates for greater participation of women in politics and decision-making. By working with 67,000 elected women leaders in five states, UN Women was able to ensure that more women participated in local village councils. National Planning and Budgeting: National plans, policies, institutions and budgets are where governments begin to translate commitments to women into practical progress towards gender equality. Too often, however, they overlook measures to ensure that public services respond to women’s needs and priorities. UN Women works with economists, planners, government officials, bankers and planning bodies such as NITI Aayog to ensure that policies and budgets reflect the needs of women across the country. Economic Empowerment: Women make enormous contributions to economies, whether in businesses, on farms, as entrepreneurs or employees, or by doing unpaid care work at home.But they also remain disproportionately affected by poverty, discrimination and exploitation.Many innovations with women farmers, women workers at home, rural entrepreneurs, former women scavengers are re-defining women’s participation in the economy. UN Women sees greater land and property rights as essential ingredients for long term change. Peace and Security: The Women, Peace and Security Agenda, enunciated in Security Council Resolution 1325 (2000) and several subsequent Resolutions, promotes the protection of women and girls against sexual and gender-based violence in conflict, as well as women’s equal and meaningful participation in the prevention and resolution of conflicts, peacebuilding and peacekeeping. Under this normative framework, UN Women India MCO leads action and advocacy on two aspects in mainstreaming gender in international peacekeeping, i.e. effective response and prevention of conflict related sexual violence (CRSV) through pre-deployment training of police and military officers and the targeted inclusion of female officers in peacekeeping through its flagship Female Military Officers Course (FMOC). Migration: UN Women India MCO works towards strengthening gender-responsive migration of women domestic workers from India to the Gulf Cooperation Council (GCC) countries by raising awareness on the risks of unsafe and irregular migration and by informing aspiring women migrant workers about their rights and entitlements which ensure safe and legal migration. UN Women also leads advocacy for the design and implementation of policies and programmes that target safe and informed migration of women domestic workers including the institutionalization of pre-departure orientation training and mass awareness campaigns. In India, UN Women builds on a strong foundation, working closely with the Government of India and civil society to set national standards for achieving gender equality. In Bhutan, Maldives and Sri Lanka, UN Women works through the United Nations to ensure that women become equal partners in development. 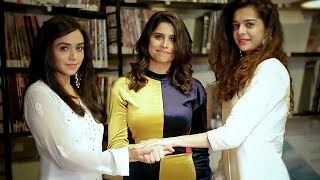 Mujhe Haq Hai the video, brings women from all fields, from all parts of India, achievers, and celebrities together.